Greetings from Arrakis yet again! 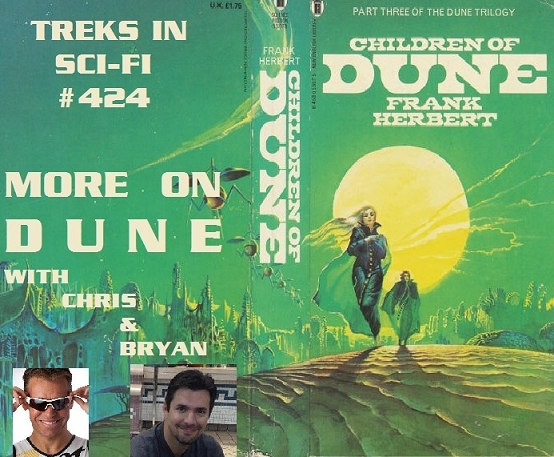 This week Chris & Bryan get into the next 2 books in the Dune Saga, Dune Messiah and Children of Dune. We also talk about the 2002 Sci-Fi Channel miniseries “Children of Dune”, which combined the two books into one story. We also get into some of the other books in the series and reflect on how wacky it all gets! Hop a Heighliner and fold space with us one more time as we travel back to the world of Dune. Thanks a lot guys for doing another cool guest spot for us. Next week I will be back here and joined by the Anomaly podcast ladies (Jen & Angela) to cover some bad Trek shows. Tune in then and enjoy your week!